The Chilean Traverse - The Plan. I know I've been quiet. I'm working on this huge upcoming project. Here's a quick update! In February 2018, I was searching for my next big mountain after a few exhilarating treks in China where I climbed my first above 6,000m peaks. I wanted to go for my first 7,000m peak. Naturally, I turned to the Himalayas but for some reason it didn't feel right. In my search for the next project, I ran across an image from NASA of Llullaillaco that stayed with me and I decided that I would instead head down to Chile. 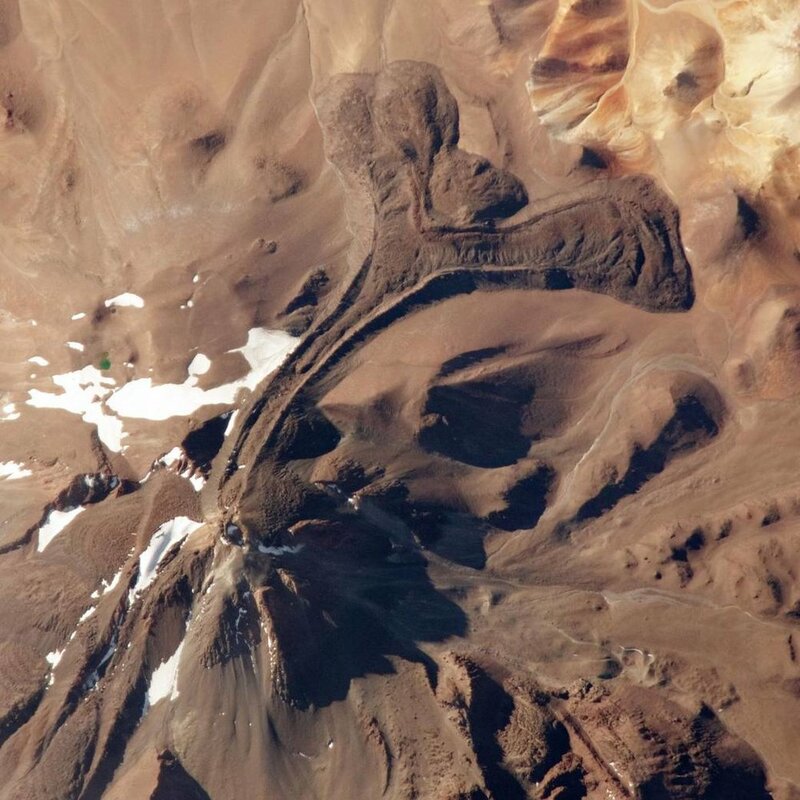 NASA - Llullaillaco from space. I knew I'd graduate from UCLA in the summer and I decided I'd do a once in a lifetime trek around this climb. I decided to try to merge my skills in scientific research, mountaineering and photography into a single job position. Bringing 3 differently skills together into a position that doesn't really exist is tough and it has proven very difficult to sell to those who sponsor this type of trips. But I do believe traveling could be done in more meaningful and useful ways. I've never been unemployed. I've always has a job in physics since I was 17 years old. For the first time in my life I will be unemployed and freelancing as I attempt to make this new job a reality. I pitched the idea to the Access Collective campaign ( http://www.getaccess.co/ ). This is group of Nat Geo photographers, athletes, models and all sorts of traveling talents which I've been lucky enough to be a part of. This group is all about meaningful travel with the help of 'soft' branding. The trips and stories are not built around the brand. Instead the brands partake in more meaningful endeavors that go further than "bucket list box checking" trips. We are now working on the biggest trek I've yet to do both physically and mentally. 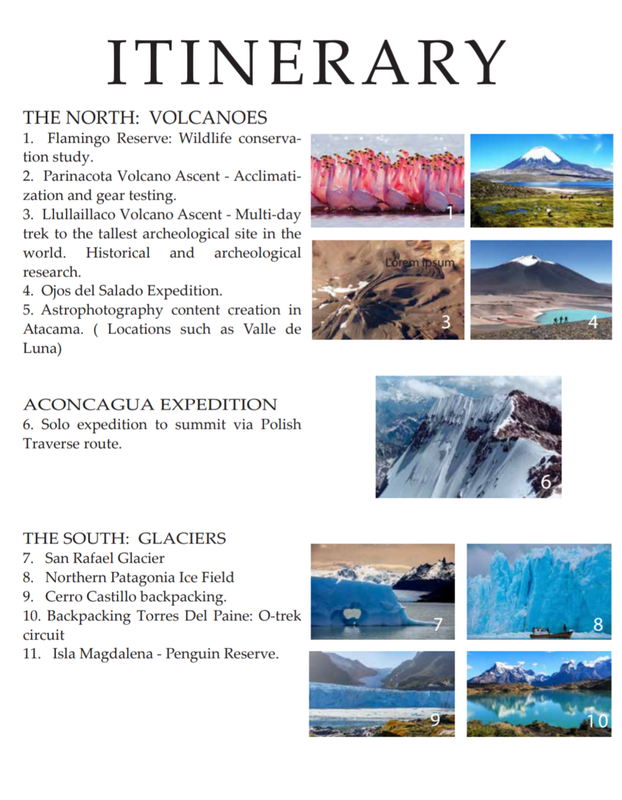 The itinerary is a work in progress but I will be traversing Chile starting in the desert of San Pedro de Atacama, climbing Aconcagua and heading down to Patagonia. I'll be there for 4 months bringing photographic content, science articles in conservation and virtual reality experiences! Currently, I am working in finding sponsorships and science research. We're still in much need of help. Any recommendations or contacts will be greatly appreciated!